All things nerdy and cool with a Chicago spin. Commander is often referred to as the “Big Mana Format”, given how the starting life total, deck size, card variance and number of players ensures that many games last over 10 turns. This allows players to easily cast spells in the high mana range. Such spells are often sweeping in scope and can be potentially backbreaking to one’s opponents. It’s this splashiness that makes Commander games fun. However, to get to that point, you obviously have to play lower cost cards. Most of the time, especially for this format, we look immediately to cards in the 3 to 5 mana range, since the game usually doesn’t really begin until after the first 3 turn cycles. Still, it would be unwise to overlook those cards below 3 CMC. In fact, here are 7 great cards that only cost 1 mana, but are great throughout the game in Commander. Some you might be familiar with, while others might be new to you. This Legacy staple also has a place in Commander. With access to multiple tutor effects that allow you to search for cards and then shuffle your library, be it from Demonic Tutor or Stoneforge Mystic or Scalding Tarn, Brainstorm gives blue players the chance to get the 2 worst cards out of their hand permanently. This level of instant speed card draw for such a low mana cost allows you to hold it for the best time and react to any spells or effects that your opponent might throw at you. Holding Brainstorm in your hand, especially with a fetchland in play can feel like you're in a definite position of power. Sacrifice outlets are always a good option in Commander, so many cards are as great going into or staying in the graveyard as they are in play, plus it gives you the ability to make sure your opponents never gain control of anything you have on board. When coupled with Grave Pact -like effects, you can really damage your opponent’s board. Viscera Seer provides all that for one black mana, with the bonus of being able to scry. In a deck built to take advantage of these strategies, Viscera Seer really shines. In most games of Commander, your best artifacts are probably going to get destroyed at some point or another. There are just too many great cards that can blow up your artifacts, from Acidic Slime to Austere Command, it’s hard to keep your toys on the board. Luckily, Goblin Welder can get it back for you, and then some. When you first read the card, you notice the linear strategy I’ve just discussed - trade your less powerful trinket into something menacing. And if you play the card that way forever, it’s still a great card. However, extending beyond that you can do some other cool thing with Goblin Welder. The first one, similar to Viscera Seer’s use, is that you can bin important artifacts you don’t want exiled so that you can get them back later. Better to have your Darksteel Forge in the yard then permanently lost forever. Even better is that you can use it on your opponents. Don’t like the artifact they have in play? Give them the one they have in their graveyard back to them in exchange. How nice of you. I almost didn’t have Berserk on the initial list, because that list existed before the spoilers for Conspiracy 2. I didn’t want to promote a very expensive card, but Berserk is very versatile for one green mana. The obvious line of play with it is to just make your attacker twice as large out of nowhere and take someone out of the game, especially if that attacking creature is your Commander. That alone can be pretty powerful. However, Berserk enters the realm of insanity once you realize that it can target any creature. Suddenly, you have a one mana way of getting someone else out of the game off the back of someone else’s creature. Additionally, you can use it as a removal spell of sorts. If a creature you don’t like is swinging in, throw Berserk at it and watch it get destroyed later in the turn. Pretty good for a color that isn’t known for the best instant speed spells. Deathrite Shaman is a Swiss Army knife when it comes to Commander. Mana ramp? Yep. Life gain? You got it. Life loss from all opponents? It’s got that too. Oh, and it is perfect graveyard hate. It doesn’t make you a cup of coffee, though. Still, that’s a lot of stuff in such a small package. Not to mention that the hybrid mana makes it easier to cast. You would think this thing should be a 0/1 like Birds of Paradise, but nope, it's a ½. This card was so pushed, it got banned in Modern for a reason. Luckily, it’s perfectly ok to play in Commander! Yes, I know colorless spells are packed at 1 CMC. But we all already know that Skullclamp and Sensei’s Divining Top are absolutely nuts. So I decided to give you a less-known 1 CMC artifact. Codex Shredder does more than you think. For one, decks that love self-mill, like Sidisi, Brood Tyrant love effects like this. Other decks that interact with their graveyard can almost see this as “Tap: Draw a card.” Beyond that, it’s a Regrowth effect that every deck can run. In those decks, Codex Shredder will get you 5+ cards at times to chose from later. Additionally, this card messes with anyone trying to use top of the library tutors like Enlightened Tutor. Mom, as everyone calls this card, can do so much for your deck, both on offence and defence. On the aggressive side of things, Mother of Runes allows your best creature to get in without worry of blockers. 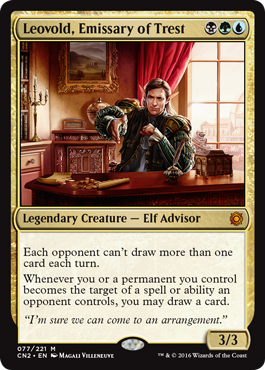 This is great when you are running a commander like Karlov, where you may not have many Voltron pieces to help push through damage. Mother of Runes it also a great counterspell in a way, seeing as how she can stop harmful spells from touching your creatures. Additionally, she can turn one of your creatures into a super blocker, including herself. That’s a lot of use out a single activated ability. The combined CMC of all the cards above is 7, which is usually the CMC of most game-warping, or even game-winning, cards in the Commander format. And while the big mana cards may still reign in the end, there is no reason to pass over cards on the small side of the CMC spectrum. In fact, given the right circumstances, these 1 mana cards can win you the game, whether sneakily or overtly. Building a great Commander deck is more about cards that help push your game plan along than it is about casting big, splashy spells. In fact, out of the 14 previous Legendary Creatures that have a Red-White color identity, 9 directly care about attacking. Out of the other 5, only Brion Stoutarm has little synergy with attacking. Gisela, Blade of Goldnight makes your attacks better. Archangel Avacyn can save your attacking creatures, same for Razia, Boros Archangel. And Munda, Ambush Leader is just trash because the best Allies are in other colors. 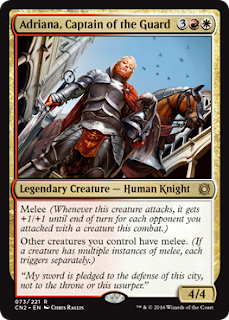 So when building a Boros Commander deck, you have two options: Brion or Attacking. Keep in mind that Red-White is the worst color pair already in Commander, and not because of its Legendaries, but because it lacks the ability to draw cards. Unique and flavorful? What a country! 1) An Archer from Fate stay/night-like character that can “forge” equipment out of your library and put it into play, possibly while dealing damage to creatures/players. 2) A reverse Soulfire Grand Master that deals damage to things whenever and instant or sorcery you control gains you life. Makes a bunch of otherwise useless life gain spells into Commander monsters. 3) A warlord that can essentially Master Warcraft during other players turns. There are a lot of unique effects in Red-White. C’Mon Wizards, let’s get a few on some Legendary Creatures. Fat Shallot's truck is hard to miss. I still remember the first time I tried The Fat Shallot. 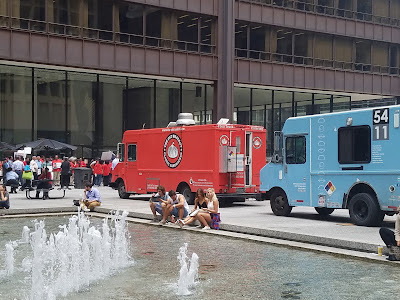 It was not long after the curmudgeons in City Hall finally allowed trucks to cook onsite and started designating areas in the loop for trucks to set up for lunch. I was curious about all the “early adopter” trucks that flooded in after the new laws, especially since The Salsa Truck had opened my eyes to the possibility that food trucks could blow brick and mortars out of the water. On a walk Clark and Monroe, which was then and still is a prominent food truck site, it was hard to ignore the orange-red truck standing out amongst the rest. The long line of people outside the truck only heightened my interest. Yet the line moved quickly, rivaling even the most established lunch places in the downtown area. Little did I know that The Fat Shallot had been around for some time before the law changes and had already established themselves as one of the best food trucks in the city. It’s no surprise to me now that they have been profiled and listed on many local area and even national websites stating such. The Fat Shallot’s focus, if it’s not already clear by the logo on the side, is “Classic Sandwiches”. However, just because they are classics doesn’t mean they are banal. In fact, I think they should change the motto to “Classics Evolved”, because all of the sandwiches have a gourmet twist that will keep you coming for more. This includes ingredients you’re more likely to find at higher-end sit down restaurants like truffle aioli and shaved fennel. Couple that with specialized rolls and buns for each menu option and you have a food truck that’s hard to beat. This truck could probably make anything they wanted, but they keep their menu tight. The main four sandwiches consist of the gooey grilled cheese, the crisp and spicy buffalo chicken, the decadent truffle BLT and the super fresh turkey sandwich. Sometimes, they will run specials like their phenomenal Polish sausage sandwich and other times they substitute the BLT with a hearty meatball sandwich during the colder months. They will also occasionally offer house-made drinks like lemonade or Thai iced tea and also may have small treats like brownies. I actually like that they keep their menu small. From a customer perspective, you are not blindsided by a wall of options, which makes the line move faster, and yet the options are varied enough to make it simple to choose what you’d like. And on the business side, their stock limited to only a select set of items, which must make inventory easier to manage. Their friendly staff are also willing to make substitutions in most cases and offer some items without the bun. Be advised though, their sandwiches are massive, even for their price, so only order the fires if you are really hungry, have a big appetite or are sharing with a friend. Out of all their offerings, my personal favorites are the truffle BLT and the buffalo chicken sandwich. The truffle BLT is a pile of bacon that perfectly balances the chewy-crispy line that most bacon fails to accomplish, topped with fresh avocado, arugula, tomatoes and truffle aioli. Oh man, that truffle aioli is where it’s at. They also use it on their truffle fries, which is also a recommendation. Not a fan of truffle aioli? Try the spicy sesame fries instead, especially if you enjoy the same spiciness that goes into sushi rolls. The buffalo chicken sandwich, can be ordered as a bowl without the bun (I sometimes do this, depending on how much bread I’m feeling that day). The chicken itself is super crispy and the buffalo sauce is the right amount of spicy without destroying the palate. It is topped with shaved celery and bleu cheese dressing. 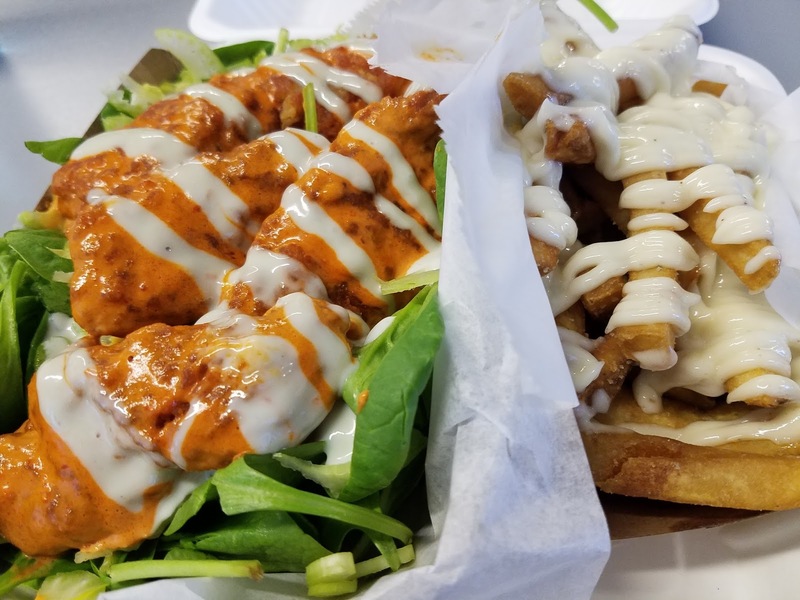 The whole sandwich takes the best experience of eating really good hot wings and makes it available as a far less messy sandwich. If you’re looking for the truck, they’re not that difficult to find. They frequent the downtown area for most of the work week and are active at many spots in the city during the weekend. They have a very active twitter feed, and will always keep you up to date on where they are, and if they have any specials available that day. Fat Shallot’s profile is rapidly expanding in the Chicago area, aside from the acclaim from multiple websites. 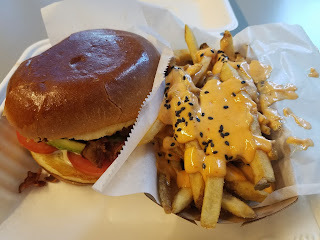 They recently opened up their second truck, The Fat Pickle, which is in every way another home-run food truck I will write about in the future. They also announced that they are going to have a stall in the soon-to-be opened Revival Food Hall downtown, which boasts an insane lineup of Chicago-based restaurants, including my favorite ramen shop, Furious Spoon. So do yourself a favor and track this wonderful orange food truck of the gods. Click this thing for trains and stuff. Special thanks to Jamie and Gabe for making this article possible. In Behind the Build, I breakdown the design of one of my commander decks, usually one with a unique spin. This time, I review my Omnath, Locus of Mana deck. Magic: The Gathering head designer Mark Rosewater is known for saying “restrictions breed creativity”, and although some people might have issues with the face of the Magic creative department, it is difficult to disagree with that sentiment. I personally have taken that as one of my few mantras. It’s surprising how useful it is, even beyond the scope of the game. Creativity usually only sparks once we are given a set of conditions. Otherwise, we often spin our wheels or simply get lost in all the possibilities. But when those options are narrowed down, that’s when we start to excel. Decision fatigue happens when you are given near unlimited options. Think of a menu at a restaurant and imagine it with multiple pages, all kinds of dishes, side dishes and extras. It can be quite daunting to choose a tasty meal, and typically we end up selecting stuff we are familiar with, even though new and exciting options are right in front of our faces. Now, imagine you’re at a food truck where you have at most four or five different options. Pretty easy to pick from that menu, right? Well, restrictions help narrow down your possible options and can lead you to trying something different. Go back to the restaurant menu example, and imagine setting a restriction like “The dish can only start with the letter M” or “the dish must not have tomatoes in it.” Well, that can lead you to things you might never have tasted before, especially if you pick the latter at an Italian restaurant. So what does this have to do with the Commander deck I’m discussing today? Building a Commander deck is itself a daunting process, especially from scratch. The format has a massive card pool, spanning over 20 years of design. Narrowing that down to 99 and a commander is not an easy feat. So we often find ourselves resorting to online guides, primers and other sources to do much of the thinking for us. And that’s perfectly fine, many people enjoy the gameplay more and will happily trade the pride of crafting a unique deck for consistency and proven results, alongside a community of similar minds constantly improving on the build. However, every once in awhile, you may want to expand outside the confines of net decks. That’s where this deck design came from. To get the creative juices flowing, I set a restriction on myself. I wanted to hobble a Magic color of its best card type, and build from there. For this experiment, I chose green. Green’s best card type is creature, I don’t think there is much debate to that. With bomb cards like Craterhoof Behemoth and Avenger of Zendikar, games can end quite quickly on resolution of these green monsters, and ones like it. 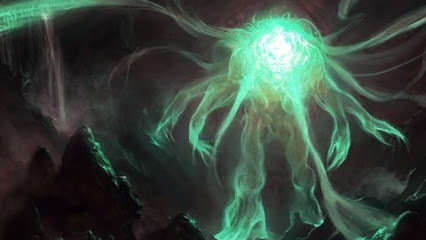 Furthermore, many of green’s most powerful non-creature spells deal with creatures in some way, and many of them care about creature cards like Green Sun’s Zenith, Survival of the Fittest or Tooth and Nail. So not only was I limiting my options for game winners, I was limiting powerful options all around. Yet, with this simple but harsh restriction, the design flourished. When I first fired up MTG’s official card search website, Gatherer, I was astounded by the creative choices I had once I made sure the search would not spit back anything with the type “Creature”. Let me take you through the key cards that makes the deck I dubbed “Mono-Green Spells” tick. Omnath is well known in the Commander community for being one of the most popular mono-green legendaries. EDHRec has it listed as #1 on their deck list count, beating out Ezuri, Renegade Leader and Titania, Protector of Argoth. However, most of the Omnath decks you will see contain many of green’s premier creatures. In fact, the deck usually ticks because of these creatures, floating mana through turns to cast a big beasty is very much a central deck strategy. EDHRec lists the average Omnath deck as containing 29 creatures. Well, I don’t have the luxury to do part of that. I do however, have a backup strategy that these decks use, which is to just win with commander damage. These are the primary commander damage win cards in the deck, allowing you to smash right through an enemy’s defences while Omnath stays huge. It’s fairly easy to catch a player on their back foot and hit them for a ton. Berserk is a very important card as it can double as a surprise for other commanders swinging in and as a removal spell of sorts, just make sure that the creature isn’t attacking you. You can use these to buff Omnath to victory, but most of the time one of these three are probably helping you win with the deck’s secondary strategy, which is tokens. Overwhelming Stampede is an all-star in my opinion, in any green commander deck, as it gives you a way to push through a stalled board state and can help you take out multiple players on one turn. Now, I understand the hate for Triumph in that people find infect to be a cheap win, and I would agree, it’s just that Wizards has not given us a comparable non-creature spell on par with Overrun and Stampede, but if they ever do, this will be out of the deck. This deck wants as many effects like this as it can get. There are a plethora of token spells in the deck, but I wanted to point out this monster specifically. Having instant-speed cards in the deck is very important, since you can float the mana you generate each turn with Omnath and not have to worry about using it should Omnath get killed. Obviously, for this card, that’s not always going to be the case, but having this as a backup plan in case some opponent-caused nonsense comes your way is always nice to have. Of course, to accompany all the token cards are the token enablers. I don’t think I need to speak on the raw power that Doubling Season and Parallel Lives provides, given that much has been said about them in the past. I do want to mention Second Harvest as an up and coming card in this deck, which can act similarly to Arachnogenesis in many situations. Every Omnath deck is hungry for large sums of green mana, and these cards provide just that. Earthcraft is downright busted and a decent, though still pricey itself, budget option for Gaea’s Cradle, which is a card that will permanently be on the wishlist for this deck. Nykthos is also a good Cradle replacement and is quickly becoming a card I throw in every mono-colored deck I play. The benefit of the amount of mana it can produce for such a small investment is insane. I recommend this card for everyone out there to try. With all that mana, these two cards can also help close out the game for any player unfortunate enough to be below your life total. I have cast this for upwards of 30 mana. These also help deal with one of green’s major weaknesses, which is flying creatures. Card draw and card selection is scarce in green, but there are still some great options, like the two listed above. Sylvan Library is a format staple and similarly on par with Phyrexian Arena. Guile, on the other hand acts as a Sensei’s Divining Top substitute, helping you shape your draws for maximum power. Couple these with cards like Shamanic Revelation and Soul's Majesty, and green has a card draw package that makes red and white cry. Removal is another place where green can falter. It can fight other creatures well enough and has not problem dealing with artifacts and enchantments, but having a catchall like Song is great. Bonus points for using song on a permanent, then playing a Vesuva to get a copy of the original permanent you just slapped the Song on. Another fantastic card in this deck for “removal” is Vow of Wildness. While it doesn’t get rid of the beast on the board, it makes it work for you and not against you. Additionally, you can slide it on Omnath should the need to win by commander damage arise. Who says green can’t have board wipes? Wizards has been kind enough to print two fantastic big mana spells to help clear the board. With the token subtheme the deck operates under, the value of both of these cards goes through the roof. Having tokens out with Aurora usually makes your board better than theirs and with the token doublers in the deck, Predation can get out of hand quick. One last package I want to mention is the snow land package, which is something I would recommend in any mono-colored deck. Scrying Sheets can give you extra card draw each turn, and Mouth is a small investment on the ability to have an extra creature removal spell in your deck. I've been drawing for as long as I can remember. I started as most people did with random doodles and incomprehensible scribbles, then moved on to cars being my main focus as a kid. I wanted to be a car designer when I was young. However, after watching Dragonball Z as a preteen, my focus shifted into character design. I took art classes all four years in high school, but had to give up that route once I moved on to college, but I never stopped drawing. I apologize for the completely non-professional work displayed below, but I want to create a record of where I currently am with my skills (or lack thereof). Recently, I completed a shift to a fully digital realm, utilizing my Surface Book and the program Clip Studio Paint to do designs digitally from start to finish. I find that this encourages me to keep at art since my sketchpad is unlimited by size and my toolbox is much larger. 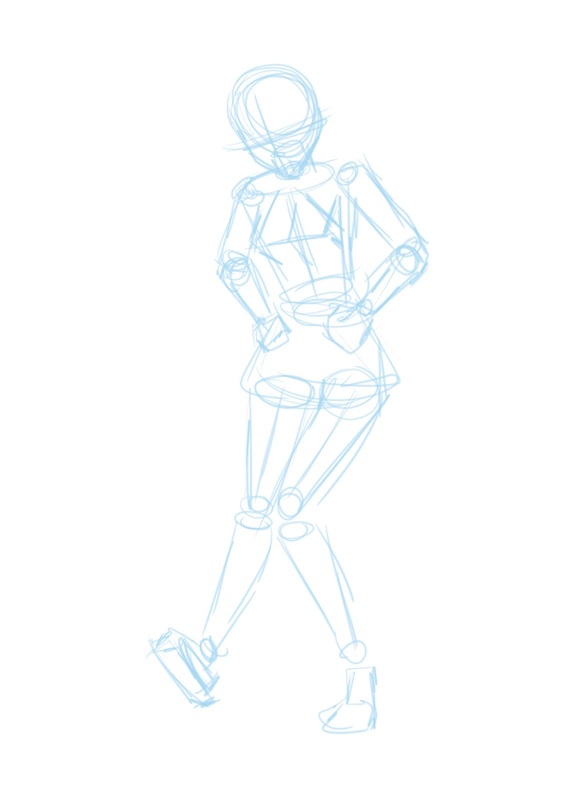 I start my design by doing a simple gesture drawing to get the pose and proportions correct. My trick here is to work with a full size canvas, but to zoom the canvas out far enough to match a normal thumbnail size. After that, I zoom back in to the full size of the paper and create a new layer to build the proper musculature over the thumbnail. I use a blue pencil to make future layers show through. 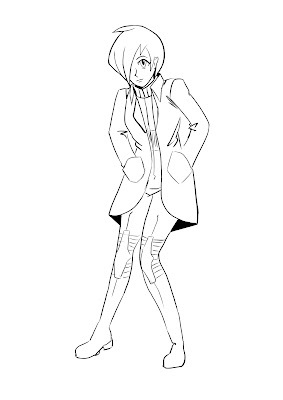 I will also adjust the opacity of the previous layer to help with discerning the new lines. Make sure to lock the lower layers so that any erasing doesn't ruin the lower layers. 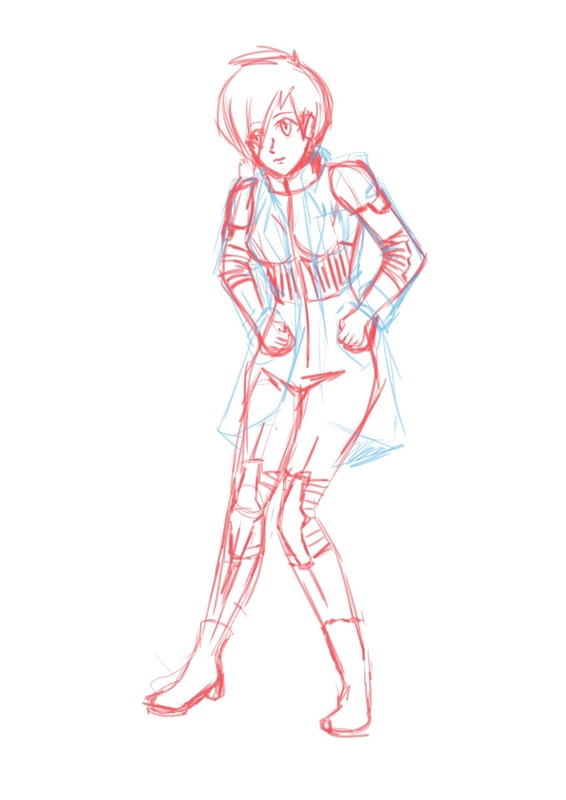 From there, I switch to a red pencil to sketch in the character details on a new layer. 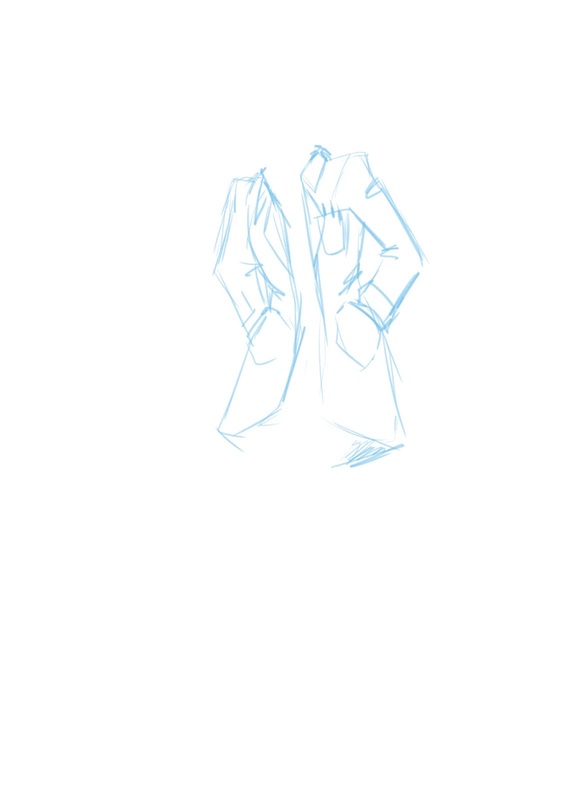 It's okay if it is rough at this point since this will be used for the ink layer. Putting some "character" on it. 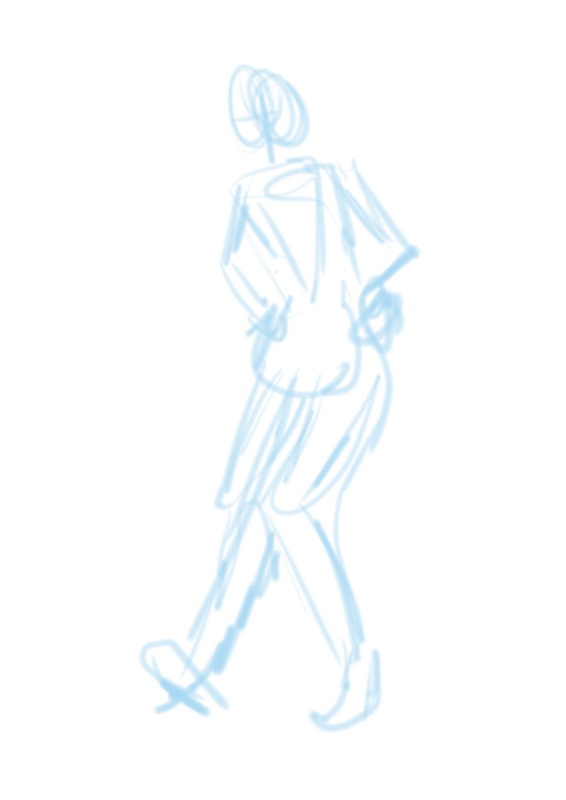 I added another layer to sketch over a coat from the previous layer, then left both visible for the ink layer. Here is the final ink layer. 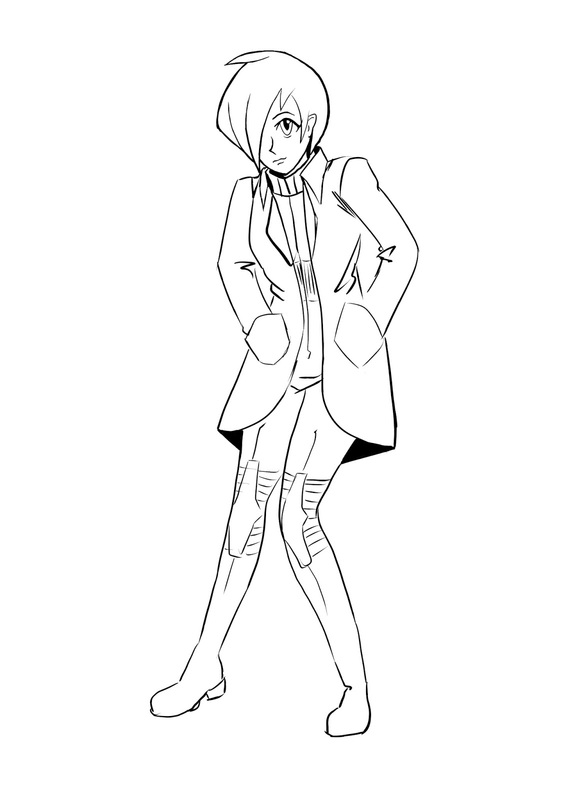 I'm still getting used to inking this way. My old process was to use a vector program to do some inking, but decided that a raster program is much faster for my needs. You will notice some bleeds and too thick lines, but I hope to have this hammered out soon. It's not perfect, but it's a start. Anyway, thanks for reading this. I hope to do future sketches with even better looking designs, but I'm still shaking some rust off. Welcome to Food Truck Primer, a series of articles where I give a rundown of different Chicago-based food trucks. I love food trucks. 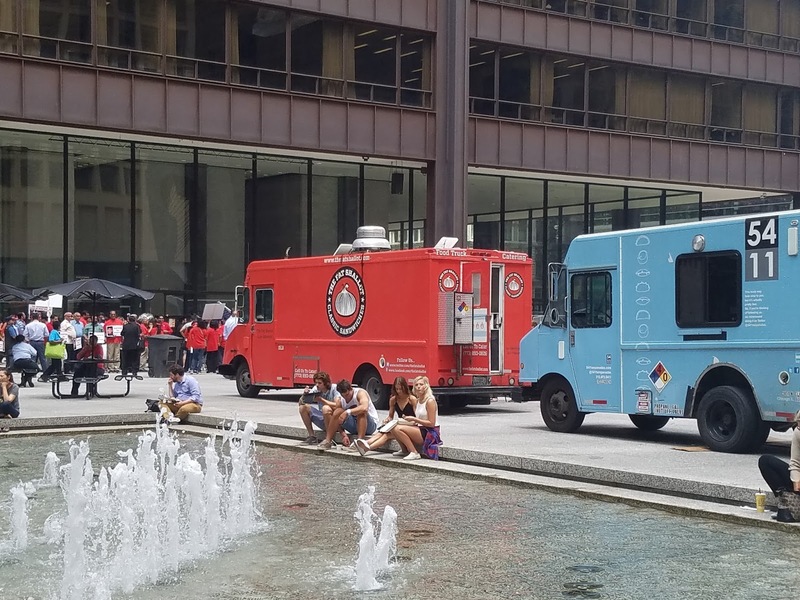 Instead of being restricted to the “safe” lunch places that comes with working downtown, food trucks allow for dining experiences that you can’t find in the types of restaurants that can afford the exorbitant rent in downtown Chicago. You can eat great food at a reasonable price and still be able to share in a collaborative community. It’s small business and local flair, much like one of my other big hobbies, craft beer. Actually, craft beer is how I found out about the first food truck I am writing about, Donermen. It was through 3 Floyds Brewing social media that I was introduced. And if you know anything about craft beer and the reputation that 3 Floyds has within the community, you could understand my excitement in trying this food truck. Donermen’s primary focus is German street food, with a focus on food made by Turkish immigrants. Their menu consists of two main dishes: Doner kebab and curry wurst. 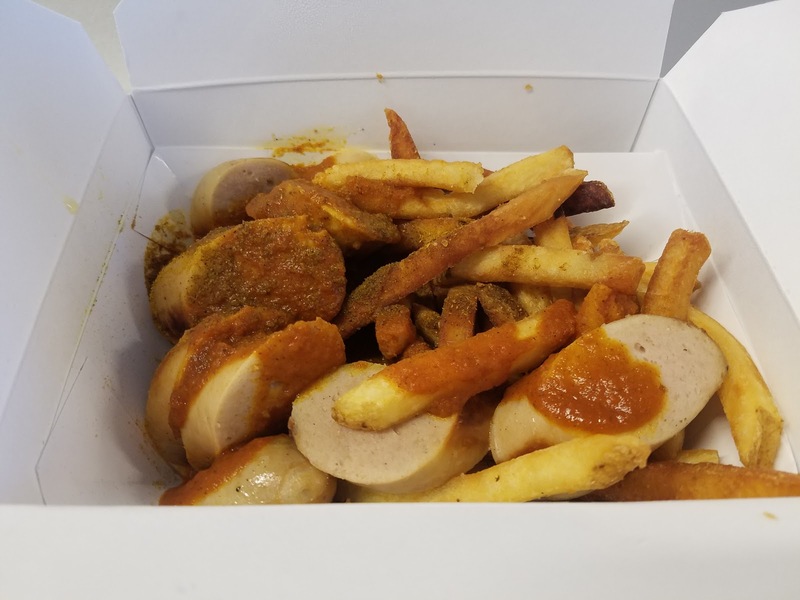 Doner kebab is spit-roasted chicken with wonderful spices while curry wurst is German sausage smothered in a tomato-curry spice sauce. 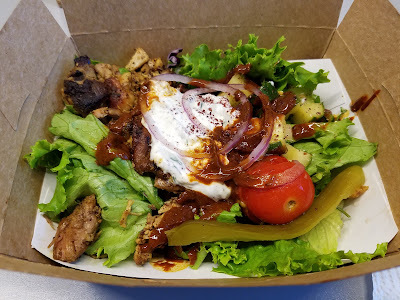 Donermen’s doner kebab comes prepared in a few ways, but I recommend the Doner Box, which is the aforementioned chicken, served on a bed of fries, salad and veggies, along with tzatziki and hot sauce. It’s a wonderful mix of colors, spice and textures. Their curry wurst is equally fantastic. The handmade sausage blends perfectly with the sweet and spicy tomato-curry sauce, while the side of fries offers a bit of crunchiness. They have brought this dish to Christkindlmarket the past two years and blows away the competition. If you’re not feeling meat for lunch, their druid wurst, which is similar to their curry wurst except the sausage is 100% vegetarian, is a fantastic selection. I find myself switching between the two often when I’m not going for the Doner Box. The truck also recently added poutine that is very good in and of itself. 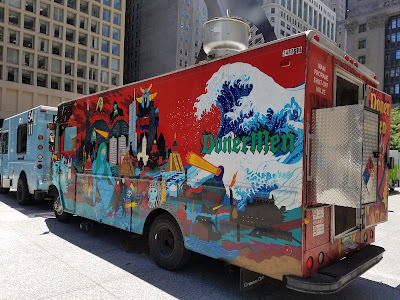 Beyond the fantastic food, Donermen also has, in my opinion, the best looking food truck. It’s hard to miss their truck wherever it is, with gorgeous mural on one side and D&D references on the other. You can find Donermen throughout the downtown area of Chicago on the weekdays for lunch and at various bars and breweries on nights and weekends. They also cater, if you ever need great food for a party. So if you see this beautiful blue and red truck out on the road, please give it a try. You will not be disappointed.